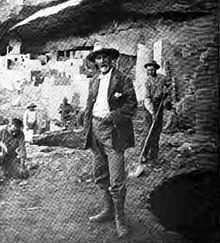 Jesse Walter Fewkes (November 14, 1850 – 1930) was an American anthropologist, archaeologist, writer and naturalist. Fewkes was born in Newton, Massachusetts, and initially trained as a zoologist at Harvard University. He later turned to ethnological studies of the native tribes in the American Southwest. In 1889, with the resignation of noted ethnologist Frank Hamilton Cushing, Fewkes became leader of the Hemenway Southwestern Archaeological Expedition, named for its patron Mary Hemenway. While with this project, Fewkes documented the existing lifestyle and rituals of the Zuni and Hopi tribes. Fewkes was the first man to use a phonograph to record indigenous people for study. He tested its use among the Passamaquoddy in Maine, before traveling to the Southwest to make his recordings of the Zuni (1890) and Hopi (1891). Benjamin Ives Gilman used these recordings to show that they used musical intervals unlike those in the Western tempered scale. In addition to the recordings, he wrote historically valuable descriptions of the music and musical practice. Fewkes surveyed the ruins of a number of cultures in the American Southwest, and wrote many well received articles and books. He supervised the excavation of the Casa Grande ruins in southern Arizona, a Hohokam site, and the Mesa Verde ruins in southern Colorado, an Ancient Pueblo site. He particularly focused on the variants and styles of prehistoric Southwest Indian pottery, producing a number of volumes with carefully drawn illustrations. His work on the Mimbres and Sikyátki pottery styles eventually led to the reproduction of many of these traditional forms and images. The Hopi potter Nampeyo became his friend and reproduced the newly documented traditional designs in her own work. In study of the Hopi Indians religious rituals and festivities Fewkes compiled descriptions and drawings of the Hopis' Katsinam. He commissioned several Hopi artist, knowledgeable in the Katsina cult and with the least outside influence in art, to produce series of paintings of the Hopis' supernatural beings, the Katsinam. This Codex Hopi, a manuscript of all the known Hopi Katsinam was the first permanent documentation of the ceremonial performers and preserved the existence of the Katsinam that otherwise may have ceased to appear. Fewkes was one of the first voices for government preservation of ancient sites in the American Southwest. By the mid-1890s, vandalism of these sites was widespread. In the American Anthropologist for August 1896, Fewkes described a large cliff dwelling called Palatki, or "Red House", situated in the Red Rock country southwest of Flagstaff, Arizona, and appealed for protective legislation. If this destruction of the cliff-houses of New Mexico, Colorado, and Arizona goes on at the same rate in the next fifty years that it has in the past, these unique dwellings will be practically destroyed, and unless laws are enacted, either by states or by the general government, for their protection, at the close of the twentieth century many of the most interesting monuments of the prehistoric peoples of our Southwest will be little more than mounds of debris at the bases of the cliffs. A commercial spirit is leading to careless excavations for objects to sell, and walls are ruthlessly overthrown, buildings torn down in hope of a few dollars' gain. The proper designation of the way our antiquities are treated is vandalism. Students who follow us, when these cliff-houses have all disappeared and their instructive objects scattered by greed of traders, will wonder at our indifference and designate our negligence by its proper name. It would be wise legislation to prevent this vandalism as much as possible and good science to put all excavation of ruins in trained hands. His research on precolumbian sites of Puerto Rico, Haiti, Cuba, Trinidad, and the Lesser Antilles were culminated into his 1907 book "Aborigines of Porto Rico and Neighboring Islands". It's an acclaimed text of early archaeology. Fewkes joined the Smithsonian's Bureau of American Ethnology in 1895, becoming its director in 1918. The Group of Tusayan Ceremonials Called Katcinas. The Smithsonian Institution; BAE Annual Report 1897 pp. 245–313. A Theatrical Performance at Walpi. Washington DC. : Washington Academy of Sciences Vol II, 1900. pp605–629. The Mimbres: Art and Archaeology. Avanyu Publishing, Albuquerque, New Mexico, republished 1993. ISBN 0-936755-10-5. --a reprint of three papers published by the Smithsonian Institution between 1914 and 1924. Hopi Snake Ceremonies; Avanyu Publishing Inc. Albuquerque, New Mexico 1986. Republication of selected works Bureau of American Ethnology Annual Report Nos. 16 and 19 for the years 1894-95 and 1897-98. Hough, Walter. Jessie Walter Fewkes. American Anthropologist 33:92-97. 1931. Nicoles, Francis S. (1919). Biography and Bibliography of Jesse Waher Fewkes (PDF). "Smithsonian Expeditions." Smithsonian Institution. 1996. Pecina, Ron and Pecina, Bob. Neil David's Hopi World. Schiffer Publishing 2011. ISBN 978-0-7643-3808-3. pp 24–29. ^ Nicoles, Francis S. (1919). Biography and Bibliography of Jesse Waher Fewkes (PDF). p. frontispiece. Wikimedia Commons has media related to Jesse Walter Fewkes.